In addition in each case the short answer from the “kölsche Grundgesetz”. We politely ask for you to make your reservation as early as possible in order to guarantee your participation in tours and to prepare the rental bikes. If you do not want to participate in a crowded group nor be rejected because we are fully booked, reservation is important. Notify us in advance if you require child trailers / seats or similar special requests. If you are a group of 8 or more guests, you can get a “private tour guide” and decide on your own departure time. Really bad weather, which leads to the termination of the tours is very rare. If it is drizzling, we will equip our guests with rain coats and where applicable stay in a covered beer garden or visit a building inside. The tours will be cancelled and fully refunded if there is a weather warning of the German Weather Service (Deutscher Wetterdienst). Guests who do not want to come on the tour at short notice, please refer to our Cancellation Policy. The security of our guests is of paramount importance. Our high-quality bicycles of the brand TRENGA.de (made in Germany) are checked regularly and have both retirement and rim brakes. The bicycles are well lit and exceed the valid safety requirements. Each guest receives a helmet free of charge. Our bike tours are along selected cycle paths and are accompanied by experienced guides. In spite of all precautions, we ask you for attentive driving and avoiding excessive alcohol consumption. Due to the strong demands we have decided some time ago for the purchase of twelve new e-bikes / pedelecs. All wheels come from the renowned brand ZEMO and the integrated BOSCH engine always ensures tail wind during the ride. The modern Pedelec system supports its pedal action up to 25 km / h and ensures a fast speed with little effort. Each of our e-bikes is equipped with “all-round care-free insurance”, so you always go on the safe side. Particularly suitable are the e-bikes for seniors as well as persons with physical impairment. In addition, the E-Bike also provides for a driving experience with the extraportion of traveling and fun. In principle, tours can be canceled or changed. Please contact us as soon as possible, preferably by e-mail. We will be happy to assist you and provide you with more flexibility and flexibility. For more than a week in advance, we book free of charge. For periods of less than one week, please note our cancellation policy in the terms and conditions. As a road user, alcohol consumption, regardless of what kind, is not a good idea. For this reason we do not take responsibility for our guests. There are various methods of payment. In the shop you can pay by any debit or major credit card as well as with cash. For payment by bank transfer, we will send our bank details to you upon request. Our tours follow a prepared route and a contents theme. However, each tour is different, depending on the guide, season, weather, construction sites, guests’ interests or other similar factors. You can be sure that each of our guided bicycle sightseeing tours is designed to provide you with a nice unforgettable leisure experience. 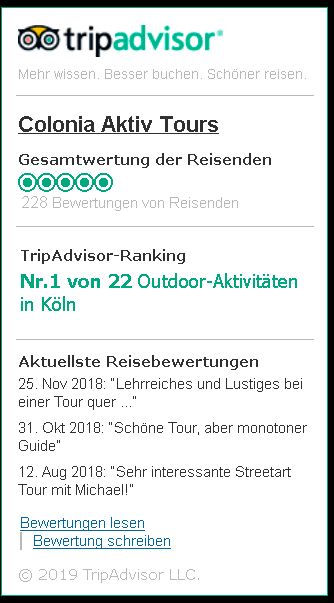 If nothing else has been arranged, the tours start before our bike rental at the Gereonswall 2-4 next to the Eigelsteintorburg. You can find a route description here. Get to know the city in an environmentally conscious way. 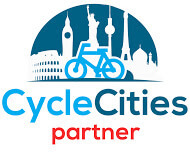 We firmly believe in the bicycle as an urban mass transport and with our presence on the streets of Cologne make a demonstrative contribution to climate protection and the rethinking of urban and traffic planning. Always keep right on the road! Use the road if there is no cycle path! Children may drive on the walkway until their 10th birthday! Only drive next to each other if the traffic is not hindered! Special signposted cycle paths must be used! Cycle paths must be used in the prescribed direction of travel! Take special care of the pedestrian traffic when walking along the cycle paths! One-way streets may be driven in the opposite direction if the signs are appropriate! When turning with hand signals, indicate the direction change! – If you drive a drunken bike, you are punishable! Use the mobile phone during cycling is prohibited! One-way street regulation Cycling against the one-way street is strictly forbidden! By means of a supplementary sign “cyclist-free” or a corresponding pictogram, many one-way streets in Cologne are now free for cycling in the opposite direction. Nevertheless, even if you are cycling against the current, you have to follow the traffic rules – drive right and take the right way! In addition, while driving on a one-way street in the opposite direction, caution is always advised, as drivers often do not have to deal with an opposing cyclist. The open one-way street offers a better and more comfortable driving flexibility in the inner city area of ​​Cologne.